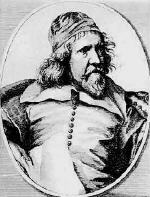 Inigo Jones was the first person to introduce the classical architecture of the Italian Renaisance to England. His works show an individual mastery of classical design with a thorough understanding of its geometrical basis. In 1613 he visited northern Italy and studied Palladio's villas. The notes in his copy of the 1570 edition of Palladio's Quattro Libri show his growing mastery of the theory and grammar of classical architecture. The son of a cloth worker also named Inigo, he was baptised on July 19th, 1573, in the church of St. Batholomew of the Less, Smithfield, London. Sir Christopher Wren is said to have stated that Inigo Jones was apprenticed to a joiner in St Paul's Churchyard. A portrait of Inigo Jones was painted by William Hogarth in 1758 from a 1636 painting by Sir Anthony van Dyck. The works of Inigo Jones show an individual mastery of classical design with a thorough understanding of its geometrical basis. 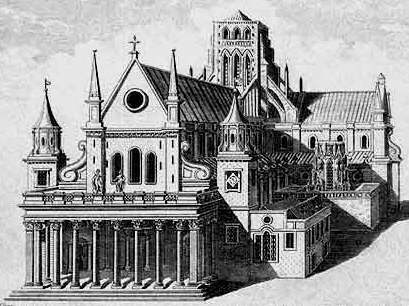 At Convent Garden he created London's first "square" (1630) on land developed by the fourth earl of Bedford, and designed the church of St Paul, inspired by Palladio's version of the Tuscon order. The "piazzas" of Convent Garden (the Italian word was Anglicised to describe the arcaded rows rather than the space between them) have been rebuilt, but the church, much altered, survives. The Queen's House in the grounds of Greenwich Palace was commissioned by Anne of Denmark, wife of James I. Reflecting Renaissance ideas of mathematical, Classical proportion and harmony, the House's design was revolutionary in Britain at the time. Typically Palladian, the facades are tripartite with a central projecting portion. Curving steps lead up to the main entrance, while the internal circular staircase is of a type recommended by Palladio. The first centrally unsupported spiral stairs constructed in England, the stairs are supported by a combination of cantilever from the walls and each tread resting on the one below. The H-shaped plan may have been modeled on the Medici villa at Poggio a Caiano. A two storey cubic hall with black and white marble floor faces the river and gives access to a loggia overlooking the park. From 1633 onwards Inigo Jones, the foremost architect of his day in England, was engaged in work of restoration and improvement of St Paul's Cathedral. A monumental portico at the West End was created in a classical style. Work ceased at the Commonwealth, and the cathedral was much neglected until the Restoration of the monarchy in 1660.